Deepika Padukone is currently shooting for her upcoming film Chhapaak in Delhi. 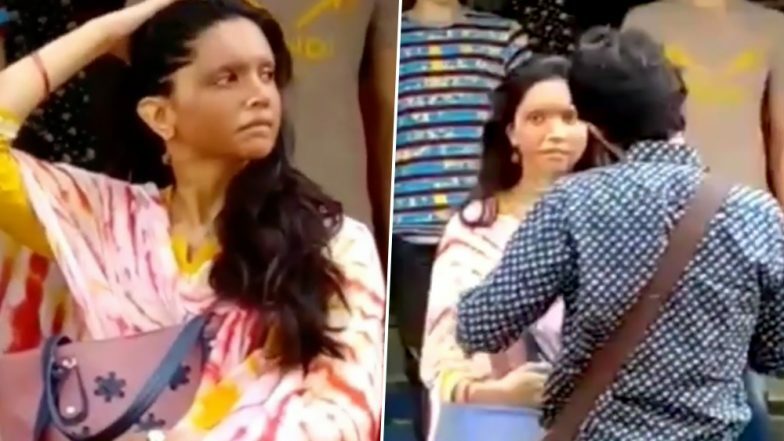 Yesterday, we saw a picture of the actress with her prosthetics, in the get up of her character Malti on the sets of the film. Now, a new leaked video showcasing her along with her co-star Vikrant Massey is going viral. In the video, Deepika is seen getting off the bike while Vikrant's character is the one riding it. A few days ago, Deepika was mobbed by fans while shooting at Janpath. In the video, we see Deepika wearing a simple yellow kurta along with a white salwar. From the video, it seems like they were shooting for an important scene considering the expressions of the two during their interaction. Ever since we saw the first look of Deepika as Malti, we have been looking forward to learning more about the film. This is the first time a mainstream actress is playing the lead role in a film as an acid attack survivor. Deepika has already received a lot of appreciation from the film fraternity and is enjoying equal support from the fans and cine-goers. Deepika Padukone Snapped in Her Chhapaak Look as She Starts Shooting in Delhi – View Pic. Chhapaak is slated to release on January 10, 2020. Deepika was last seen in Padmaavat directed by Sanjay Leela Bhansali. Fans are now been eagerly waiting for her next release.